A 75SQN Hornet departs Tindal for the Middle East. 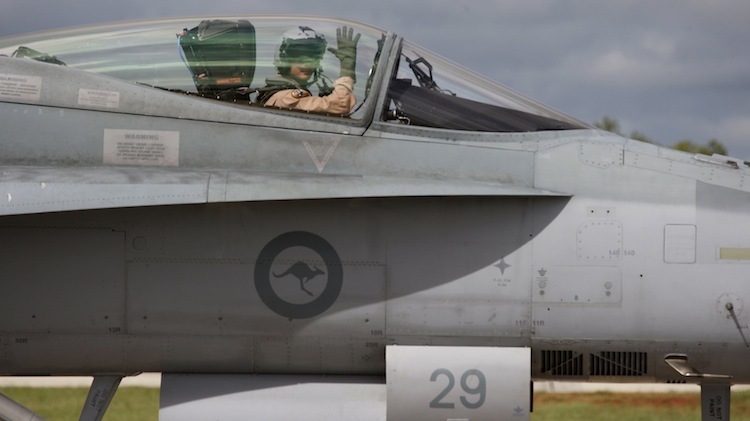 A contingent of 75SQN Royal Australian Air Force (RAAF) personnel and six F/A-18A Hornets have departed from RAAF Base Tindal for Al Minhad Air Base in the UAE where they will replace the six F/A-18F Super Hornets flying combat missions over Iraq under Operation OKRA. The six 75SQN jets will join the KC-30A tanker transport and E-7A Wedgetail AEW&C aircraft operating from Al Minhad, while C-130J Hercules and C-17A Globemaster airlifters remain available to provide additional humanitarian and logistic support as required, Defence stated. As of figures provided on March 3, the F/A-18Fs had completed 179 missions, expending 221 precision-guided weapons. The Super Hornets are due to return to Australia in the coming month. I did question if this would happen on a post in a previous article but it wasn’t known at the time. Are the Super Hornets returning to allow deeper maintenance activities that can only be performed in Oz, to spread out air frame wear and tear, share out combat experience amongst different crews or some other reason? Will the KC-30s and Wedgetails also be swapped around? I wish the crews from Tindal all the best and a safe return home. I wonder what impact it will have swapping 2 seat jets for single seaters. I would assume that there would be slightly different tactics used. I would imagine the 2 seat jet would be better placed in a insurgent conflict like we have in Iraq. Having 2 sets of eyes and ears per aircraft would certainly be handy when dealing with ground forces and manoeuvring an aircraft in such an environment. Best of luck the the boys and girls from 75sqn!